A lot of runners have lauded the shoe on how comfortable it is. Some testers have reported going sockless with the Quantum 360 Knit and not having any hot spots or blisters. As noted by most testers, the stretchy knit upper molded well to the foot, giving a glove-like fit. A lot of runners shared that the upper offered great ventilation. The knitted upper fabric proved to be good at keeping the feet dry during runs, commented a consumer. Testers have stated that the cushioning material of Quantum 360 Knit delivered as promised; it did great in terms of helping protect the feet and legs from the impact generated by footfalls. Some were pleasantly surprised by the damping technology of the Gel Quantum 360 Knit, which gave them smoother strides & takeoffs. The outsole tread has been observed to provide good grip even on wet surfaces. Some claimed that the upper granted good structure on the midfoot and heel cup area, which prevented foot slippage. A handful of wearers has commented on how heavy the shoe was for them. There were a lot who claimed that it's half-a-size smaller. A runner had also noted that this shoe’s mid-sole tended to be noisy or squeaky during runs. Some testers observed that the mid foot area was a bit narrow. The mid-sole tended to be stiff and needed a break in period, a couple of runners claimed. The Gel Quantum 360 Knit features a seamless knit upper that afforded runners a sock-like fit and exceptional breathability. It delivers responsive and exceptional cushioning upon impact while providing strong-push offs, thanks to its signature 360 Gel Technology. While many are impressed with the quality of this shoe, there were others who felt that it is a bit heavy and narrow. Overall, it’s a good road shoe for neutral pronators who need a reliable ride for short to mid-distance runs. Overall I would say that the GEL-Quantum Knit 360 is a shoe that will suit casual runners, who basically want to do running and walking purely to keep fit. I sweat quite a lot even on my easy runs, so for me, a shoe is either for casual wear or for running, and i tend not to mix the two because a shoe you sweat in will smell eventually, and a knitted shoe you sweat in will smell even more. 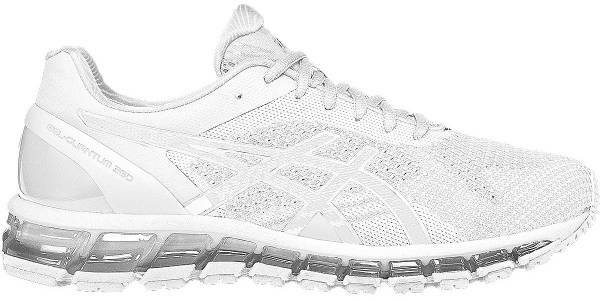 The Gel Quantum 360 Knit features Asics latest cushioning technology—the 360 Gel Cushioning System. It consists of a silicon-based unit that surrounds the perimeter of the platform, providing shock absorption upon landing while also ensuring high performance upon takeoff. The knit upper features a seamless construction, which provides a stylish ride & a smooth, glove-like fit that's free from irritation. The X-40 Ortholite Sockliner is a material that staves off moisture, enhances breathability and adds to the shoe’s rebound properties. The shoe’s structure is well supported by the Heel Clutching System. This is an exoskeletal heel counter that allows better fit & support, therefore avoiding foot slippage. Quantum Gel 360 Knit comes in standard measurements—both for its length and width. The forefoot, midfoot and heel areas are all in medium sizes, providing a snug fit. The available width for both the men and women’s versions is medium. The shoe’s shape is semi-curved to accommodate the natural curve of the runner's foot. Just like the popular Asics Gel Nimbus 21, this shoe's outsole unit utilizes AHAR®, a highly durable material known for its capacity to provide good traction & grip. Flex grooves make the platform more flexible. They basically allow the foot to move more naturally through the gait cycle. The midsole is mainly made up of the 360 Gel Cushioning System, which runs from the forefoot to the rearfoot of the shoe. This provides the shoe with great impact absorption quality while allowing the smooth heel to toe transition. The Solyte Midsole material provides a good amount of cushioning. It doesn’t wear off easily, so it’s able to provide underfoot comfort and responsiveness, even after multiple uses. The Trusstic® System is also added in the midfoot part of the sole unit to maintain the structure of the platform and avoid foot-twisting during movement. The upper is made of knit material that lends the shoe its stylish look while providing exceptional breathability. Its seamless construction ensures a running experience that’s free from skin irritation. Thin yet well-structured overlays are printed on the sides of the Quantum Gel 360 Knit’s façade. They help in terms of hugging the foot in place. The Exoskeletal Heel Clutching System also provides the rear of the foot with much-needed support & a great fit. It also prevents accidental shoe-removals. The padded tongue and collar give a bit of cushioning to the top area of the foot, as well as the ankles. They also offer good lockdown.